Some days deserve lamb curry and rice. Special days like Sundays when the whole family gathers around for lunch. 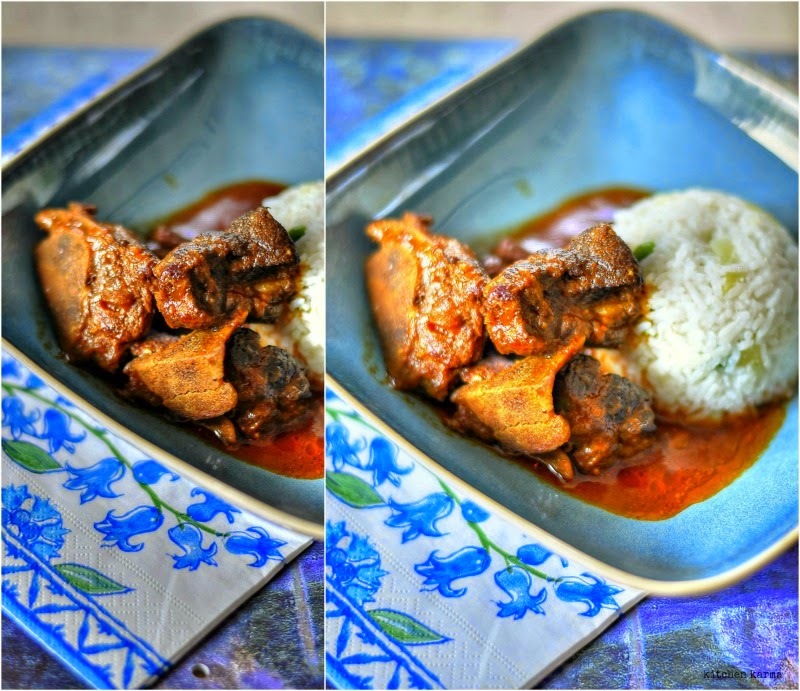 This is a Bengali must-have on all special occasions Only difference is that we make this with goat meat, which in my opinion is way more tender and tasty. But then I maybe biased. Cut out the maybe. I am biased. My mother makes a mean goat curry but the goat curry queen is my grandmother. I have grown up eating her succulent & tender goat curry. For me she would keep the most succulent pieces. Ah those good old days. Much later, after I had got interested in cooking, once I saw her make the goat curry. The whole time she was talking to me about of all things love. She cooked with hardly bothering to look. Chucked in the ingredients this way and that, forget measuring, she did not even look at them. While speaking to her, I kept getting distracted, asking her whether more masalas should go in or the curry needs to be cooked some more. All my apprehensions were for nothing. When I sat down to eat it was perfect same goat curry as ever my grandmother had produced over the last half a century! Ohhh me gusta el curry buena realizaciòn como siempre,abrazos y saludos.